We are finally getting ready to leave Bolivia after spending 3 months in this beautiful place. Sadness. We absolutely loved this country with its eclectic pace, chaotic way of doing things, drop-dead gorgeous landscapes and colorful cultures and traditions. The diversity in the country, especially considering its size, is amazing. 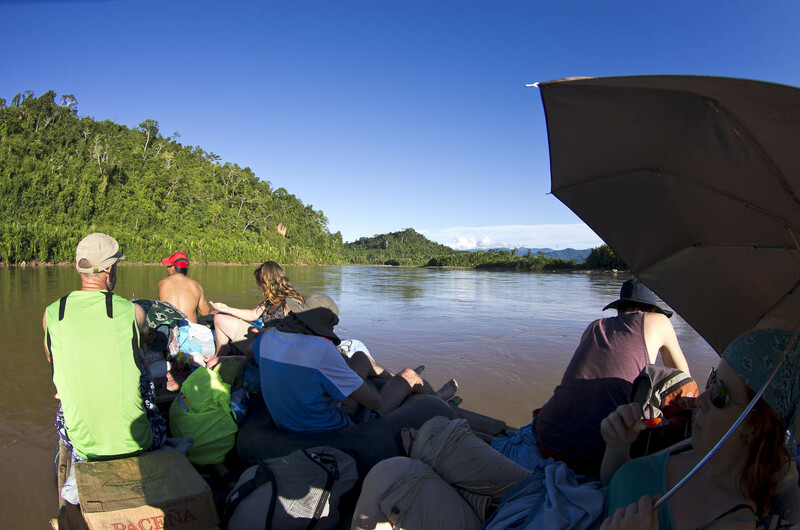 The jungles of the Amazon rainforest mix with high altiplano lakes with flat salt plains and 6,000 meter peaks not far away. 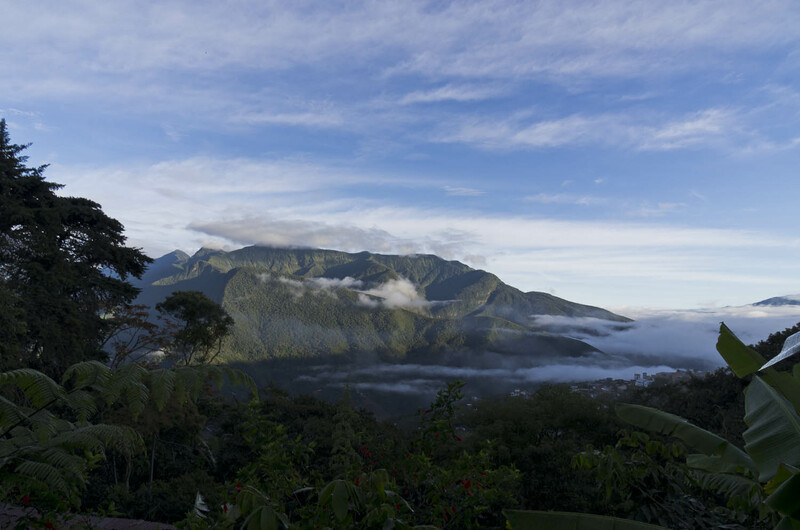 One minute you can be among the icy cool 16,000 ft snow-capped peaks and in an hour be transported to the humid, tropical cloudforest. The people here are notoriously shy but if you speak the language and make an effort to understand the different culture here, you will have some success in cracking a smile or two. Don’t be afraid to make mistakes. Go on, give it a try! So I’ve compiled this list of my top tips for navigating the country in hopes to help reduce your culture shock. For those of you traveling the country, or planning to, I hope you will find it helpful and for those not coming to Bolivia, maybe it can give you a feel for what traveling in this country is like. typical transport include antiquated school buses from the US circa 1960! Hold on it’s going to be a bumpy ride! Let’s start with antiquated planes that shake, shudder and make you fear for your life. I still think we deserve an “I survived BoA airlines” t-shirt after our flight from Cochabamba to Tarija. Sca-ry! It put a new found fear of flying into me. Don’t think the buses are any better! With dirt, bumpy, precipitous roads that wind around endlessly, buses that are even older than the airplanes and possibly drunk drivers-you’re going to need mucho suerte (lots of luck). Taxi/collectivo drivers are probably the worst. These drivers think they are pilots and will come literally centimeters (sometimes millimeters!) away from other cars or people. Don’t even get me started on the horn blowing or the cumbia music blasting out the speakers. Speaking of riding in cars and buses forget about seatbelts! Just hold on and hope for the best. Even for infants or children, car seats barely exist. Children are often piled in, sitting on their families laps reminding me of the days of when I was a kid and life was a lot less stricter but perhaps more dangerous. That being said, children are raised much differently here than in your home country. Running around in restaurants is part of the norm here and you will often see children walking home alone from school at a very young age or standing on the side of busy roads by themselves-just keep in mind that things are different here and the attitude towards child-rearing greatly differs from what you may have experienced. Toilet paper and bottled water-they are your best friends in this country. The water is not safe to drink (be careful of ice cubes and fresh/fruits vegetables that could be washed in contaminated water-also ask at the market if your juice is made with bottled or tap water). There is also a seeming shortage of toilet paper in the country-so always carry your own. Better be safe than sorry. You can’t even expect it in the hostels and you can forget about 2-ply or a backup roll. They are history! 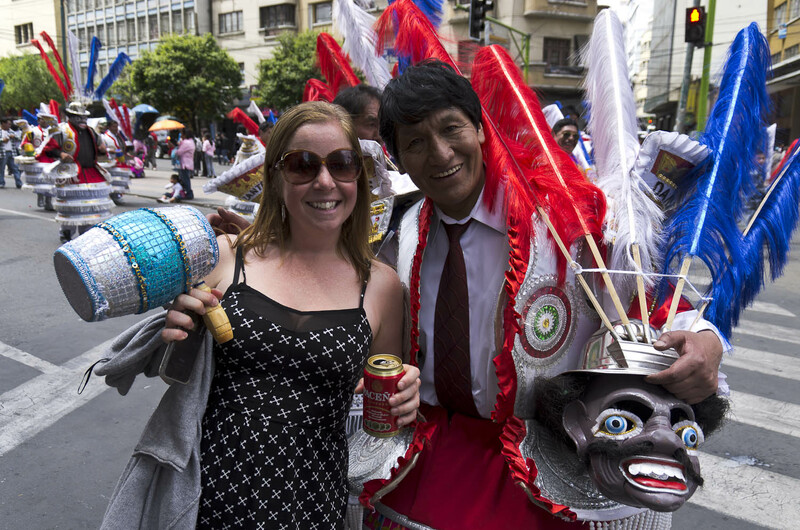 Bolivians are notoriously shy-that is until you share beer and conversation with them! Learn the language for crying out loud! You are not in your home country where they speak English, German, French…whatever. 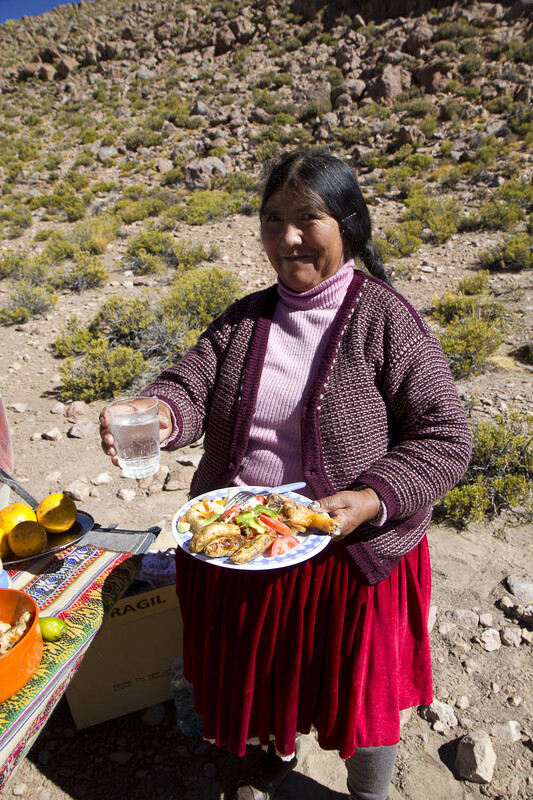 They speak Spanish, Quechua or Aymara in Bolivia. It’s very hard to be fluent but at the very least, learn a few phrases to help you get by. Never assume that people just speak your language! Your effort will be appreciated and a little bit can go a long way. Just today I saw a group of young people from the UK walking up to an empanada stand and just barking out orders in English. How hard is it to say or learn ‘uno, por favor?’. Not very. Laurent thought he was discreet when he snapped this photo until the lady started shouting ‘propina!’ (tip) and chasing us! It’s ALWAYS better to ask first! Be respectful of the culture. Don’t just waltz up to a cute kid or woman in traditional clothing and start snapping their photo. Both are indeed very photogenic but you could be offending their culture. Try asking first (in Spanish!) or at the very least, be discreet! Unbelievably, I can’t tell you how many time I’ve seen tourists do this (including my own boyfriend!) without asking permission first! And don’t be surprised if they ask you for money. Your camera costs more than they will probably ever make in their lifetime. Don’t be so cheap and fork over the .50 cents if you want to get in their face. 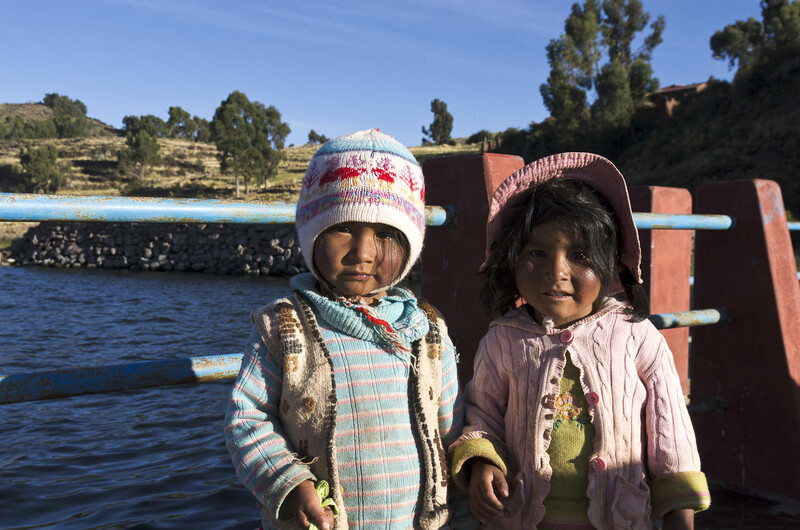 It wouldn’t hurt you to read up a little bit on Aymara or Quechua customs too. bargaining in the markets for gifts is normal, just don’t take it to far! Stop haggling with everyone! Bolivia is a really cheap country to travel! With $5 beds, $2 cocktails and $3 lunches-you can live well and cheaply here. Sure you don’t want to get ripped off and asking for a discount at a hostel if you are staying consecutive nights is fine. Or if you are buying multiple items at a market stall-a little negotiating is par for the course. But I’ve seen or heard people (bragging no less!) of how they ‘talked the driver down’ or talked the poor old lady whose hands are completely tattered from making blankets down 10 Bolivianos (just over US $1). Big deal! Now go pat yourself on the back and think of those old woman’s hands and eyes for the rest of your life and how much more she could use your one lousy dollar. I’ve heard tourists (esp young backpackers) gripe over the difference of 10 or 20 bolivianos ($1-2) over the dumbest things. I get that you are on a budget and so are we but take into consideration these peoples lives! I’m against getting truly ripped off but haggling ad nauseum just makes you look (and sound-if you are bragging) like an uncaring idiot. Ah, electric showers. I remember when we were first introduced. I barely knew you then. I was curious but hesitant. I got to know you intimately from icy cold to lukewarm to seeing sparks and getting shocked. Fret not. 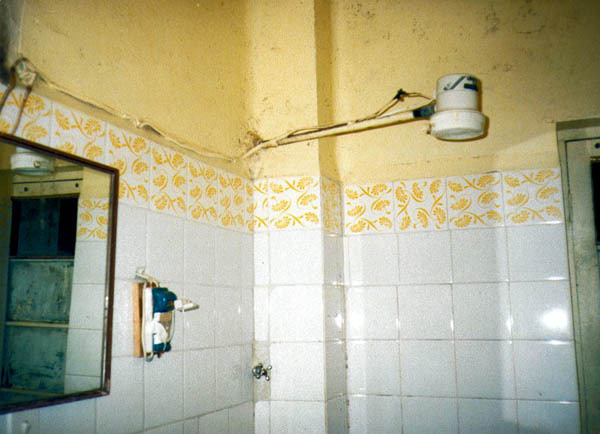 Bolivia DOES have gas heated showers but the norm are these shower curtain-less, Maguyver-esque set ups. The first time I used one, I winced the entire time. It’s okay in a warm climate where hot showers aren’t so necessary but in La Paz in the winter when it’s freezing. You are better off shelling out some extra money on a place that has reliable gas showers. It will probably become your best friend for a a night or three at least once while traveling in Bolivia. 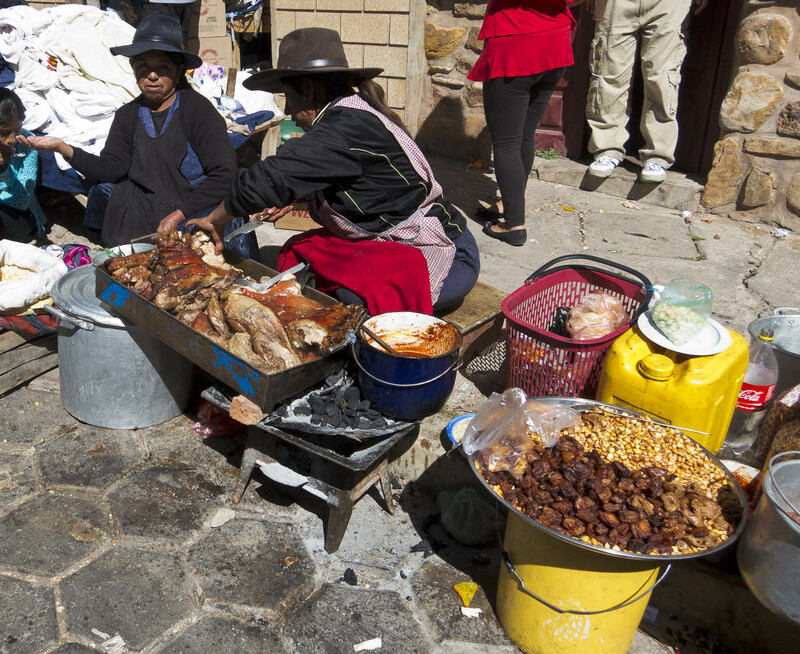 Eating at markets and on the streets is a tempting and risky affair. Food storage in this country is hmm…how should I put it? Non-existent! A stroll through the markets reveals meat sitting out-sometimes in the sun, often with flies buzzing about. Even at the most gringo-friendly or cleanest-looking restaurants you are bound to have a bout or two with food poisoning at some point. I got sick on two different occasions which lasted for several days. It’s just part of traveling the country and look at it this way, your body is building up more immunity! Be sure to stay hydrated, try to replace your electrolytes (sodium, calcium, magnesium) and have some yogurt or kefir (to promote healthy bacteria) when you are feeling better. Two completed unrelated items grouped together. Smoking is allowed in restaurants and bars. 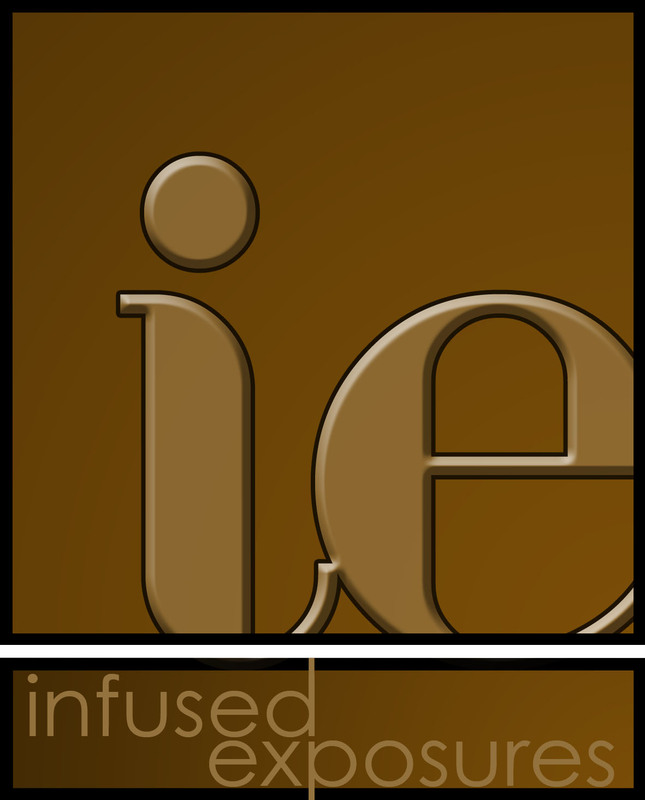 If you are a smoker you will rejoice. If you don’t smoke you might be horrified. Just a warning! And whipped cream. Bolivia loves the stuff. And I mean LOVES! If you order a fruit salad-often if not always it will come served with heaps of whipped cream (some in a horrifying color of pink!). Also be on the lookout for the ladies selling cups of jello with cream. Sometimes there is not even jello, only whipped cream! Consider this your heaven if you like it! be sure to read the signs carefully in the windshield to find your destination-it’s an art form when the collectivo is speeding past you! Mini buses are all over every city and for 1.50 Bs (.21 cents!!) you can get anywhere (near and far) within city limits. The bus is even cheaper. They are pretty easy to use-just be sure to look at the signs in the windshield to see if they are going where you want to. If unsure, just ask the driver. They CAN be cramped (we’ve often witnessed old men standing hunched over to fit in) but it’s fun getting around like the locals and VERY cost-effective. 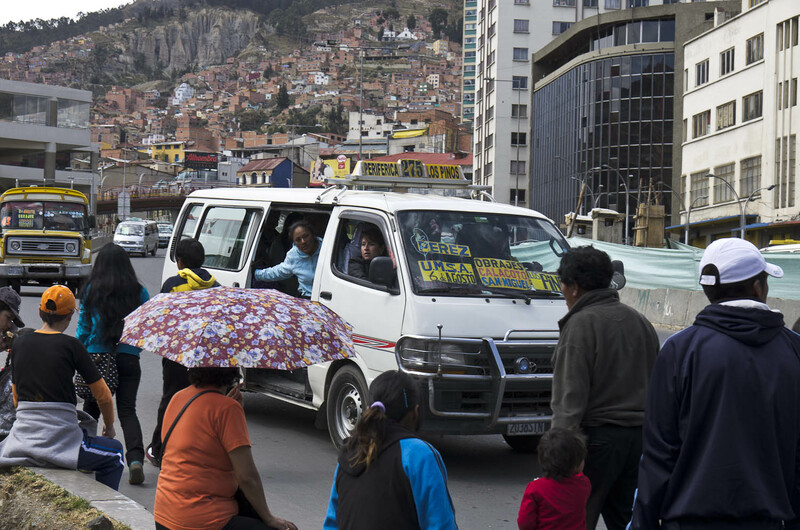 Cabs are usually cheaper than your home country but for Bolivian standards, they are expensive. That said, sometimes it’s handy to take them-like when going to/from airports and bus stations when you have a lot of luggage. There are also shared taxis called ‘trufis’ that are much cheaper than regular taxis (because they are shared). It works similar to the mini-bus, where you have to read the sign in the window to see where they go. 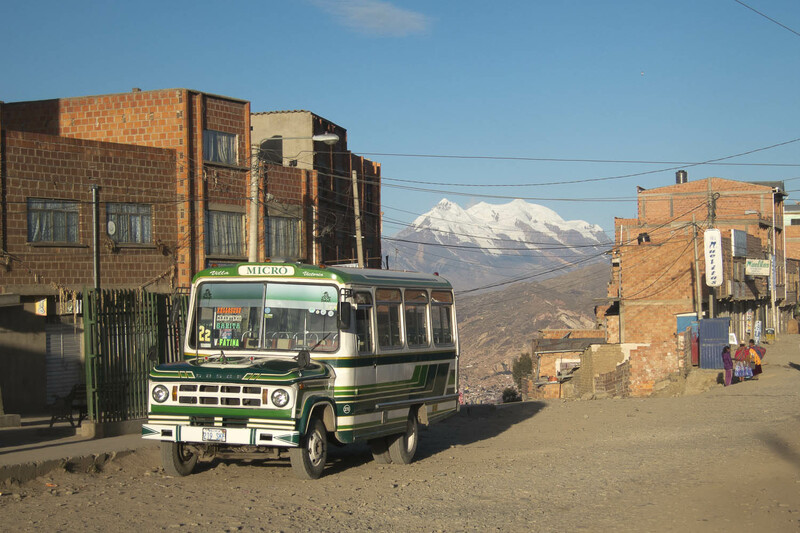 Often in Bolivia, the trufis are numbered too according to which part of the city they travel in and which route. If you know the number of the trufi you want to take, it makes it very simple to use this economical form of transport. Whichever mode of transport you choose-make sure you agree on the price BEFORE you get in! There are no meters or regulations and drivers just make up whatever price they want. Find out what the going rate is by asking someone (or a few people) and if you are quoted a ridiculous price-tell them you won’t pay it or try another cab/mini-van/trufi. adopting the tranquilo way of life is pretty easy! This could be Bolivia’s motto. Tranquilo means quiet or relaxed in Spanish. Bolivians take this to new heights! It could apply to things operating in a timely fashion (a rarity! ), getting your order taken in a restaurant (slow! ), getting used to your drinks arriving possibly after the meal is finished, hostel owners/workers busy with their own agendas and not attending to yours but in general it just applies to the seemingly haphazard way of life in this part of the world. Bolivians don’t put much of an emphasis on anything really except taking it easy and slowly and without much concern for you at all. For a lot of westerners, this could be serious culture shock. Best advice? Just embrace it-no hurry, no worry! Out of all the countries we have visited, Bolivia has taught me the most patience! You just have to accept and go with it. Type A personalities will likely burn and crash. And while you are letting go-literally let go of that guide book. I can’t tell you how many times I see people actually carrying their Lonely Planet, Rough Guide or my boyfriends least favorite Routard. Let go, people-really! 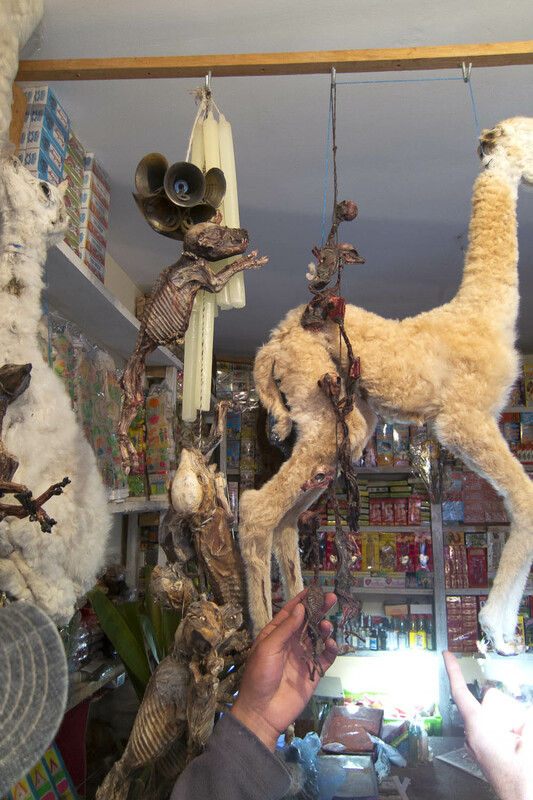 Speaking of carrying things around-be careful in La Paz. You are in big city so don’t be walking around with your camera around your neck or even worse-in your hand! All big cities have a certain degree of danger. You wave around your goods, whether it’s cameras, jewelry or watches and you could be asking for trouble. Maybe some of these sound a bit negative. I am only trying to bring some awareness and prepare those that plan to travel in this country. In addition to these warnings, remember that the cultural identity in this country is strong. People here love to have a good time too. Parades and celebrations happen almost every weekend somewhere (if not everywhere)! 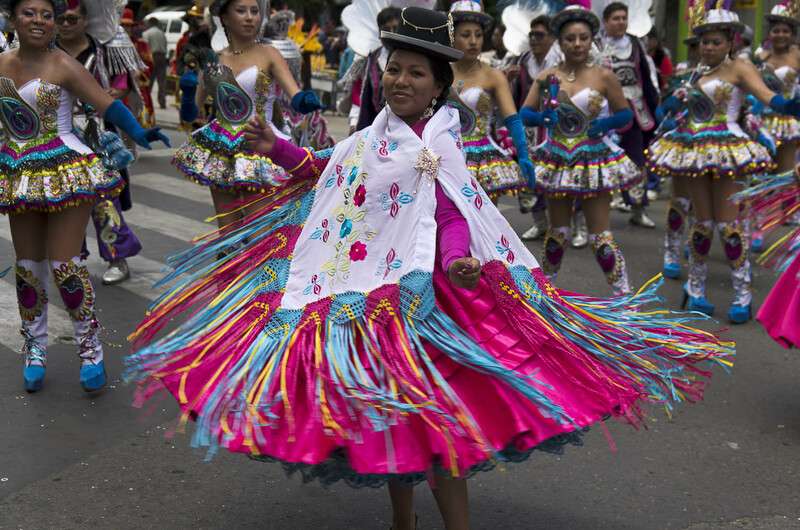 Bolivians love any excuse to play music, dance and dress up in traditional costume. They are family-oriented, hard working and most are very religious too-some in a Catholic sense but many also have a deep appreciation for nature and mother-earth. The tranquilo attitude is contagious and allows for many spontaneous things to happen. Just roll with it and be up for anything! Have you traveled to Bolivia before? What did you think? If you have any tips please feel free to add them! 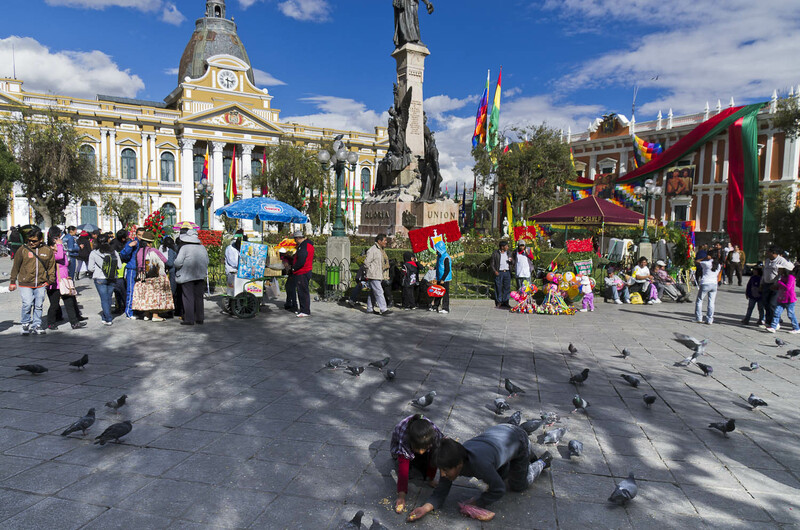 Great tips to help us through the crazy but beautiful country that is Bolivia. Still laughing at the fact that Laurent’s not so subtle picture taking resulted in you being chased by an old lady asking for a tip – priceless! Hi there, Maribel from Bolivia(comosur.com) Nice reading your blog about Bolivia from another perspective. Patience is key in Bolivia for sure. Pictures: Super nice to post that tip of understanding to not point & shoot. 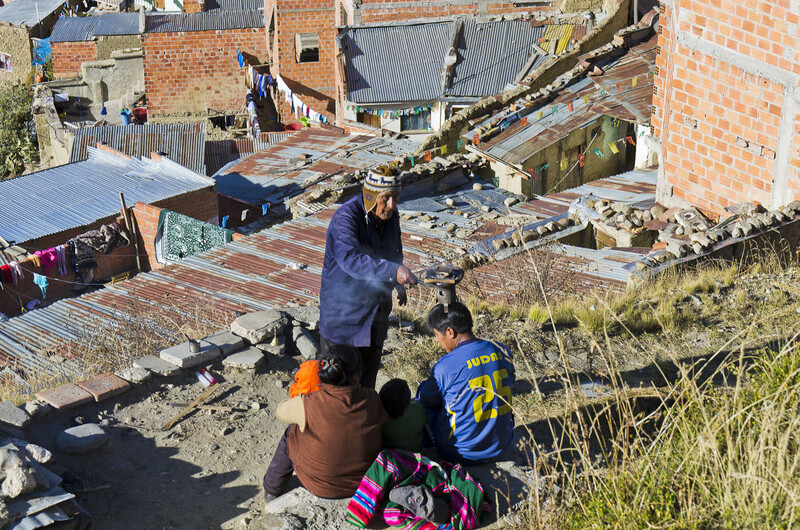 The Aymara culture believes it steals their soul and brings bad luck for their business. Which is why they are so closed about it. Collectivos::Are you referring to the mini-buses or the trufis? Mini-bus jammed packed vans. Trufi- taxi cars with a mix of people on a set route? I’ve never heard anyone here say collectivos? Both safe & reliable as you mentioned. Hi Maribel! Nice to ‘meet’ you. Yes, I see tourists too many times getting right in people’s faces. 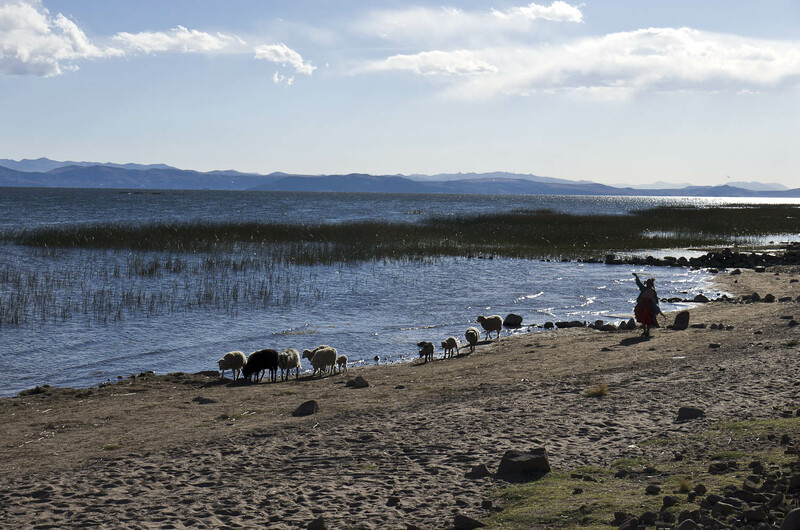 It’s terrible just on a human level but especially here on a cultural one (I had heard that Aymara culture believes that the camera stole their soul but wasn’t sure if it was true!). For the collectivos, I was referring to the mini-vans. We did take the trufis too but more often, the buses. I always called them collectivos! No one ever bothered to correct me-thanks for it though and I am going to edit the article noting the difference between Trufis & mini vans. Thanks for the clarification!